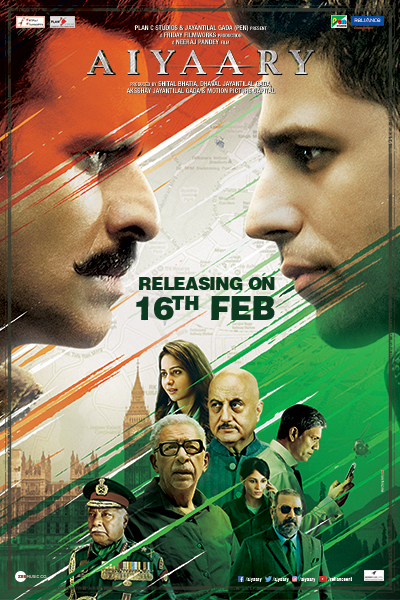 Neeraj Pandey directed Aiyaary finally received a Censor Board certificate, clearing the decks for the film’s release on February 16. The approval comes after getting required clearance from the Central Board of Film Certification (CBFC) and the Ministry of Defence. Post review of the film by the CBFC, a special screening was held for the Ministry of Defence as instructed by the CBFC. The screening resulted in prescribed modifications to the film, providing which Aiyaary finally received its censor certification, an official statement said. Neeraj Pandey took to Twitter and posted a picture of the censor certificate. Actor Manoj Bajpayee, who stars in the film, also took to Twitter and wrote, “That’s a green light for #AiyaaryOnFeb16 with no more pit stops along the way! Thank you #CBFCIndia and MOD”. Starring Manoj Bajpayee and Sidharth Malhotra as the mentor and protege, Aiyaary also features Anupam Kher, Naseeruddin Shah, Rakul Preet Singh and Pooja Chopra in lead roles. Aiyaary Synopsis: Two Indian Army officers. A mentor. And his protégé. Two officers with a patriotic heart suddenly have fallout. The mentor, Colonel Abhay Singh, intelligence par excellence has complete faith in the system of the country. While protégé Major Jai Bakshi thinks otherwise because of what he has seen and heard in his recent stint in surveillance. Jai Bakshi decides to turn rogue and this is what kicks off the story. Abhay has 36 hours to rein in Jai while Jai sits on a secret that can bring down the Government. Stay tuned we have a brilliant interivew with Siddharth Malhotra about the film coming up soon!